The Padaung, or Ka-Kaung as they call themselves, are a sub-group of the Karen. Ka-Kaung means 'people who live on top of the hill'. 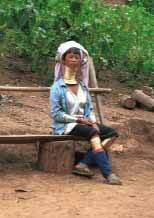 Padaung women are often referred to as 'giraffe' or 'long-necked' because of the custom of placing brass rings around their necks from when they are young girls until they marry. The practice is fast disappearing. In fact it is not the neck which has stretched but the shoulders which have been forced down by the weight and pressure of the rings. Unfortunately they are most likely to be seen paraded like animals in a zoo - which is how the first and last set of photos were taken. 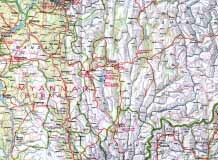 The first photos were taken in December 1988 down the Pai river from Mae Hong Son in Thailand on the border with Kayah State in Myanmar - probably where the women originated. The middle set of photos were taken in Kalaw market in Shan State, Myanmar in September 1998 when two Padaung women walked through the market with shawls almost concealing their neck rings from view. The last set of photos were taken on the same 1998 visit and show two Padaung women living in traditional houses built in the grounds of a hotel on the edge of Lake Inle, Shan State, Myanmar.